Tinker Schuman from the Lac du Flambeau Band of Lake Superior Chippewa Indians stands next to the weaving Mary Burns did of her as part of the original Ancestral Women Exhibit (left). For the last two years, Mary Burns’ exhibit featuring weavings of ancestral women of Wisconsin’s 12 tribes has been traveling around the area. Thanks to a group of women from the Lac du Flambeau Band of Lake Superior Chippewa Indians though, the exhibit is now being brought to life. Mackenzie Martin continues our We Live Up Here series with the story of 22 weavings and one theater performance that together are celebrating native women in Wisconsin. Mary Burns is a fiber artist in Mercer and a couple of years ago she embarked on an ambitious project. 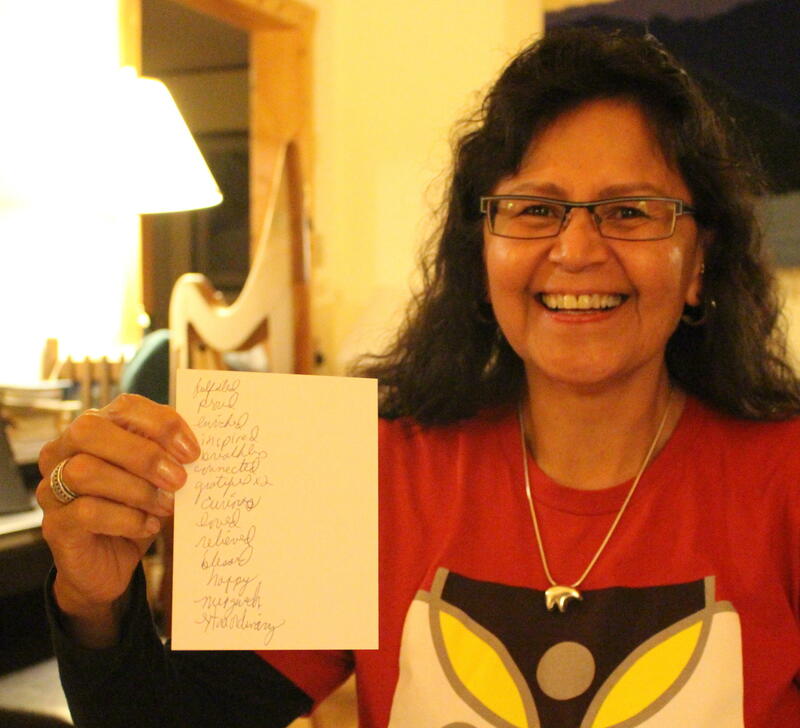 She decided to create an exhibit to honor elder women of each of the 12 tribes* in Wisconsin. She didn’t feel like ancestral women in Wisconsin’s tribes were being honored enough. “So I went to the tribes to see if they were interested and if so, who they might want to have honored in the exhibit,” she said. With help from the tribes, she was able to select 12 ancestral women to honor. Then using photographs that they provided, she wove larger than life portraits of the 12 women on her hand-jacquard loom. The final exhibit is called Ancestral Women and also features weavings of six clan symbols and four landscapes. It opened in 2016 and is currently at Northern Michigan University. Nine performers from the Ancestral Women: the Performance Project at the Milwaukee Public Museum in November. The project didn’t stop there, though. Recently, Burns’ weavings have inspired something new. A group of women from the Lac du Flambeau Band of Lake Superior Chippewa Indians has been working to bring the exhibit to life. In mid-November, they performed Ancestral Women: the Performance Project for the first time at the Milwaukee Public Museum with children from the Indian Community School. On the stage were large prints of Mary Burns’ original weavings. Much of the performance involves the person in the portrait themself or a relative, telling stories about the person pictured, as well as tribal history as a whole. Some of the stories are happy, and some of the stories are hard to hear. “Did you know, many of our grandparents and great-grandparents and great-great-grandparents were forced to go to boarding schools?” asked one of the performers to the audience. In addition, because of the way we naturally tell stories differently each time, each performance is expected to be a little different. Carol Ann Amour has a background in education and theater and she says before the first performance, they spent a lot of time traveling around to reservations and communities around Wisconsin, listening to what women thought about it. The goal of the project is to share the stories and contributions of native women in Wisconsin and to inform those who may not know a lot about the 12 tribes. In addition to Mary Burns’ exhibit, Amour says the performance is inspired by strong feelings about the importance of ancestors. Christine Doud holds a piece of paper where she wrote down how people felt right after the first performance: fulfilled, proud, enriched, and inspired. Christine Doud was the stage manager for the first performance. She says what touched her the most was the emotion, tenderness, and love that the women exhibited as they spoke about their ancestors. Representing the Forest County Potawatomi Community during the November performance was Mikiya Alloway, talking about her great-grandmother, Mary Waubiness. Tinker Schuman is the ancestral women that represents the Lac du Flambeau Band of Lake Superior Chippewa Indians. She spoke for herself during the November performance and she’s a big part of the performance project as a whole. She says what they’re doing goes beyond traditional theater. The performance project beings with Schuman's blessing and ends with a poem written by Schuman, called "Ancestral Women Of Creative Spirit." In addition to doing the original weavings, Mary Burns has also been involved in the performance project. She says the entire experience has been a privilege. Future performances of Ancestral Women: the Performance Project will be taking place on March 9th at 2:00 p.m. at UW La Crosse as part of the Widening the Circle Conference. 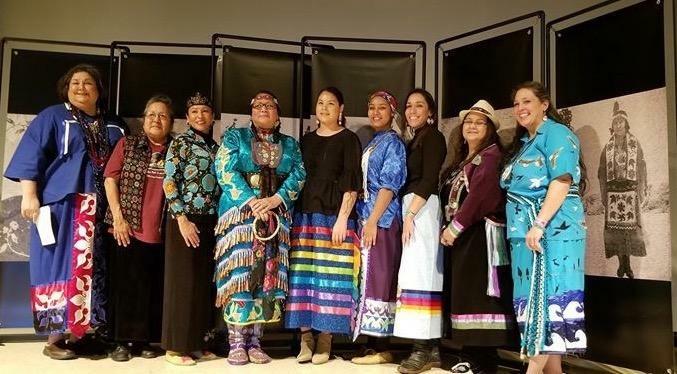 There will also be a performance in March as part of Lac du Flambeau Cultural Connections. They will also be doing a workshop on the production and message of Ancestral Women April 26-27 in Wisconsin Rapids at the Wisconsin Indian Education Association. You can find out more about Ancestral Women: the Performance Project by getting in touch with Carol Ann Amour at amourcarol@yahoo.com. You can donate to the project on GoFundMe here. More information about Mary Burns’ original Ancestral Women Exhibit: Wisconsin's 12 Tribes is at www.ancestralwomen.com. More information on Mary Burns is here. *Only 11 of the tribes included in this project are federally recognized. The Brothertown Nation is seeking federal status. This story is part of our We Live Up Here series, where we tell the stories of the people and culture of northern Wisconsin. Music for this story came from Blue Dot Sessions: Dirty Wallpaper and Ferry Landing by Blue Dot Sessions (www.sessions.blue). Performance audio for this story came from Sugar Shane Webster.